Washington, D.C. – As reporters prepare to cover the soon-to-be-released 2018 Social Security and Medicare Trustees Reports, Social Security Works provides you with this background analysis which summarizes what are likely to be the Social Security Report’s key findings (based on last year’s forecasts), and puts them in context. Please note that this backgrounder addresses only the Social Security’s cash benefits Trustees Report (Old Age, Survivors, and Disability Insurance Trustees Report), and not the Medicare Trustees Report. In addition to reviewing this backgrounder, we invite you to speak with our president, Nancy Altman, who is a nationally recognized Social Security expert. (See her bio below.) We also urge you to review our fact sheet that discusses, among other things, misinterpretations by non-experts caused by over-emphasis of unrealistically long valuation periods. You may also want to read Columbia Journalism Review’s “Report Card on Social Security Coverage,” written in response to coverage of the 2012 Trustees Report. The report will show that Social Security is fully and easily affordable. The question of whether to expand or cut Social Security’s modest benefits is a question of values and choice, not affordability. Indeed, in light of Social Security’s near universality, efficiency, fairness in its benefit distribution, portability from job to job, and security, the obvious solution to the nation’s looming retirement income crisis, discussed below, is to increase Social Security’s modest benefits. The average annual benefit received by Social Security’s over 61 million beneficiaries is less than $15,000 this year. Moreover, expanding Social Security not only addresses the retirement income crisis, it also is part of the answer to growing income and wealth inequality and the financial squeeze on working families. Expanding, not cutting, Social Security while requiring the wealthiest among us to contribute more – indeed, their fair share – is the best policy approach to addressing these challenges while restoring Social Security to long-range actuarial balance. Cutting those modest benefits will only exacerbate these challenges. Consistent with that pledge, nearly 20 Social Security expansion bills have been introduced in the House and Senate. The Social Security 2100 Act, introduced by Rep. John Larson (D-CT-01), has 170 cosponsors in the House of Representatives. Several Democratic candidates running in special elections this year, including Conor Lamb and Hiral Tipirneni, campaigned on protecting and expanding Social Security benefits. The report will project Social Security’s cumulative surplus to be roughly $2.95 trillion in 2018, growing to about $3 trillion by around 2021. It will show that Social Security is fully funded for the next decade, around 93 percent funded for the next 25 years, around 87 percent funded over the next 50 years, and around 84 percent funded over the next 75 years. Without a single penny of additional revenue, Social Security will have sufficient income and assets to pay all administrative costs and full benefits to America’s seniors, people with disabilities, their families, and survivors of deceased workers for around one and a half decades, and around three-quarters of all benefits and associated administrative costs thereafter. (The 2017 report projected that Social Security could continue to pay full old-age, disability, and survivors benefits until 2034, and more than 77 percent of all benefits after that. This year’s report may vary slightly, but not significantly. As soon as the report is released, this backgrounder will be updated with the latest projections and released as a fact sheet.) Moreover, like the 2017 report, this year’s report will show that, with modest legislated increases in revenue, Social Security will be able to pay all scheduled benefits for the foreseeable future. Income to Social Security from all sources will exceed all expenditures in 2018, which is why the program’s reserves will continue to grow (see Figure 2 below). As Figure 1 (see p. 2) shows, Social Security has three revenue sources: 1) wage contributions from employees, matched by employers; 2) investment earnings on Social Security’s U.S. Treasury bond holdings (which have the same legal standing and status as other interest-bearing Treasury bonds issued by the government); and 3) dedicated revenue from the inclusion of a portion of Social Security benefits in income for purposes of determining income taxes owed. The nation is facing a looming retirement income crisis where most workers will be unable to cease work without a drastic reduction in their standards of living. Over half (52 percent) of American households headed by someone of working age will not be able to maintain their standard of living in old age, and this figure rises to roughly two-thirds when health and long-term care costs are also considered. Traditional employer-sponsored defined benefit pension plans are disappearing, leaving workers, at best, defined contribution retirement savings plans, which have proven inadequate. Around half of households aged 55 or older had zero retirement savings in 2013. Among those households age 55-64 with some retirement savings in 2013, the median amount of those savings was about $104,000, equivalent to an annuity of just $310 a month. Thus, it is not surprising that today two-thirds of senior beneficiaries rely on Social Security for a majority of their income. Social Security will certainly be even more important to tomorrow’s seniors. As important as restoring Social Security to long-range actuarial balance is, it is imperative to remember that it is simply a means to the end of providing America’s families with basic economic security. Recognizing that Social Security is a solution to our looming retirement crisis and other challenges facing the nation, serious analysts, and a growing number of policymakers and nonprofit organizations, have advanced responsible, fully-funded proposals, which expand Social Security, while restoring it to long range balance. Nancy Altman, President of Social Security Works and Chair of the Strengthen Social Security Coalition, has a 40-year background in the areas of Social Security and private pensions. She has taught at Harvard University. She served as Alan Greenspan’s assistant in his position as chairman of the so-called Greenspan commission, the bipartisan commission whose recommendations formed the basis of the Social Security Amendments of 1983. She is the author of The Battle for Social Security: From FDR’s Vision to Bush’s Gamble (John Wiley & Sons, 2005), and co-author, with Eric R. Kingson, of Social Security Works! Why Social Security Isn’t Going Broke and How Expanding It Will Help Us All (The New Press, 2015). 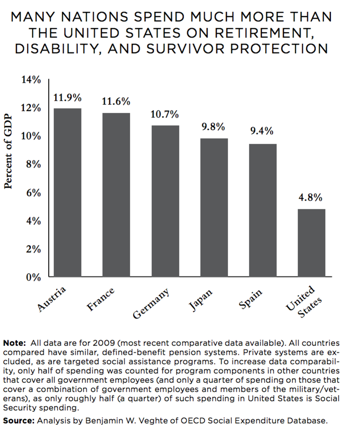 For more information about Social Security Works or the Strengthen Social Security Coalition, visit http://socialsecurityworks.org/.